I think by now everyone has heard of green smoothies. 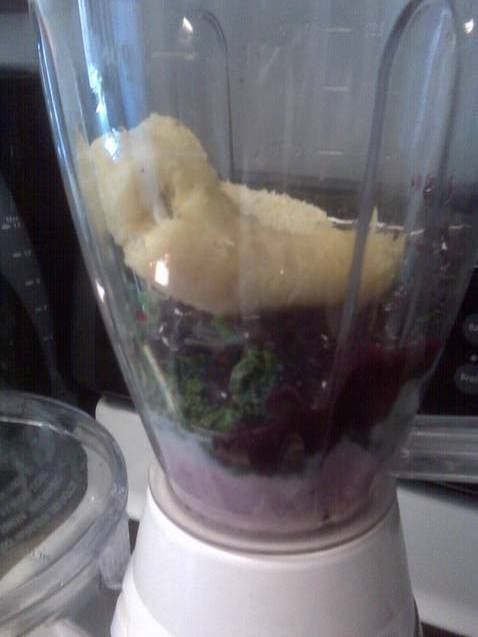 You know, a smoothie with green veggies added to it. I've tried lots of variations on this recipe and must tell you that broccoli is not good in a smoothie. It tastes too much like broccoli. Which is fine, I mean, I like broccoli and eat it often. But not in a smoothie. My favorite green addition is frozen spinach. I like it better than fresh because I think it breaks up finer. You can't taste it. And it's packed with nutrients. This is what I made the other day. The vary from smoothie to smoothie based on what I have in the kitchen at the time. * Blend everything together. Serve over ice. I don't always add jam. But there was just a little bit left in the jar and I was in a clean out the fridge mood. It adds to the sweetness but is certainly not necessary. Especially if your banana is brown- those are sugary-sweet all on their own. 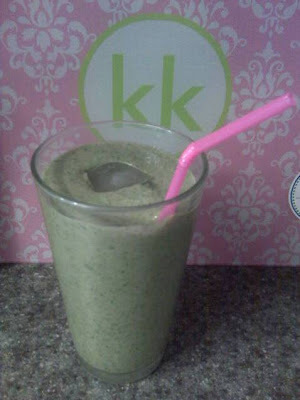 Thanks for sharing the ingredients and direction on how to make a green smoothie. I wanna try doing it at home. I really want to get into juicing with spinach. I've heard such good things about it! Looks yummy! Almost anything looks yummy to me these days. =) I just noticed your comment on my blog. Thanks for stopping by!! I've been reading about these but there were always ingredients I didn't have on hand. Spinach and bansnas I always have. I may have to try this! This looks great thanks for sharing!